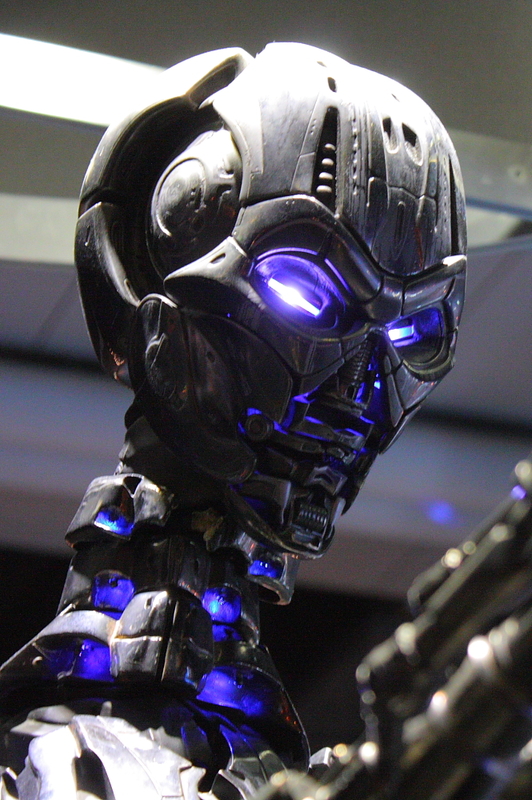 In conjunction with the upcoming release of Terminator Salvation (T4), an exhibit featuring the cyborgs from the Terminator series is now on display at Miraikan (National Museum of Emerging Science and Innovation) in Tokyo. 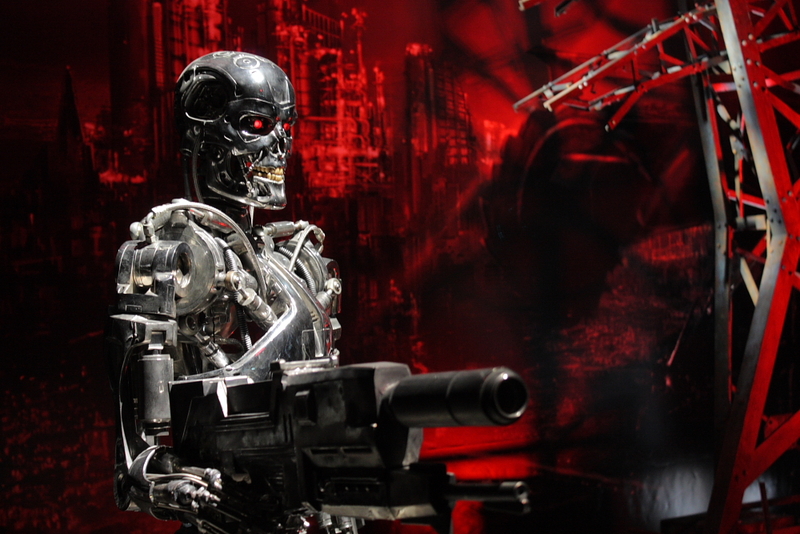 Entitled "Terminator Exhibition - Battle or Coexistence? Robots and Our Future," the exhibit purportedly aims to inspire visitors to think about the relationship between humans and machines. Mostly, though, it offers a unique glimpse at the models and costumes used in the filming of the movies, along with details about the makeup and special effects. 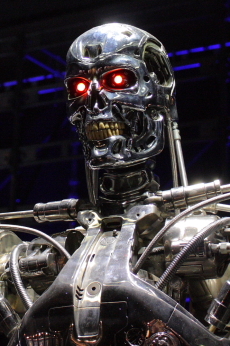 In the first Terminator movie, which takes place in Los Angeles in 1984, a T-800 cyborg assassin is sent back in time from the year 2029 by Skynet, an artificially intelligent military computer system that rules the world under an army of cyborgs. Its mission is to erase the existence of John Connor, who in the future becomes the leader of the human resistance forces against the machines. To alter the course of history in Skynet's favor, the T-800 must terminate Sarah Connor before she gives birth to her son John. 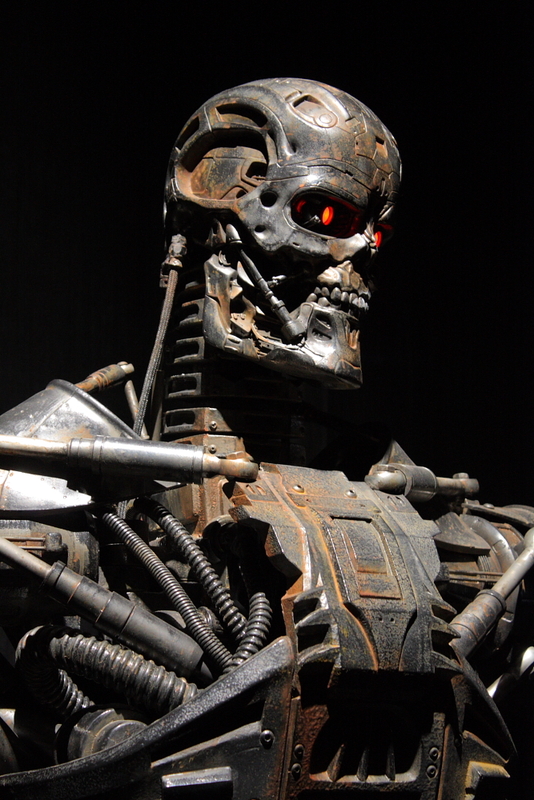 The T-800 cyborg -- played by Arnold Schwarzenegger in the first three Terminator movies -- consists of a metal endoskeleton under a layer of living human tissue. The robot has excellent learning capabilities, enabling it to understand and adopt human behavior and phrases. It can also mimic voices once it hears them. A slightly improved version of the T-800 -- the T-850 -- appears in Terminator 2 and Terminator 3. In Terminator 2, Skynet sends the latest Terminator model -- the T-1000 -- to Los Angeles in 1994 to eliminate the 10-year-old John Connor. At the same time, the resistance forces send a hacked T-800 from the future to protect John. The T-1000, which is much more advanced than the T-800, has no endoskeleton and consists of a shape-shifting liquid metal. 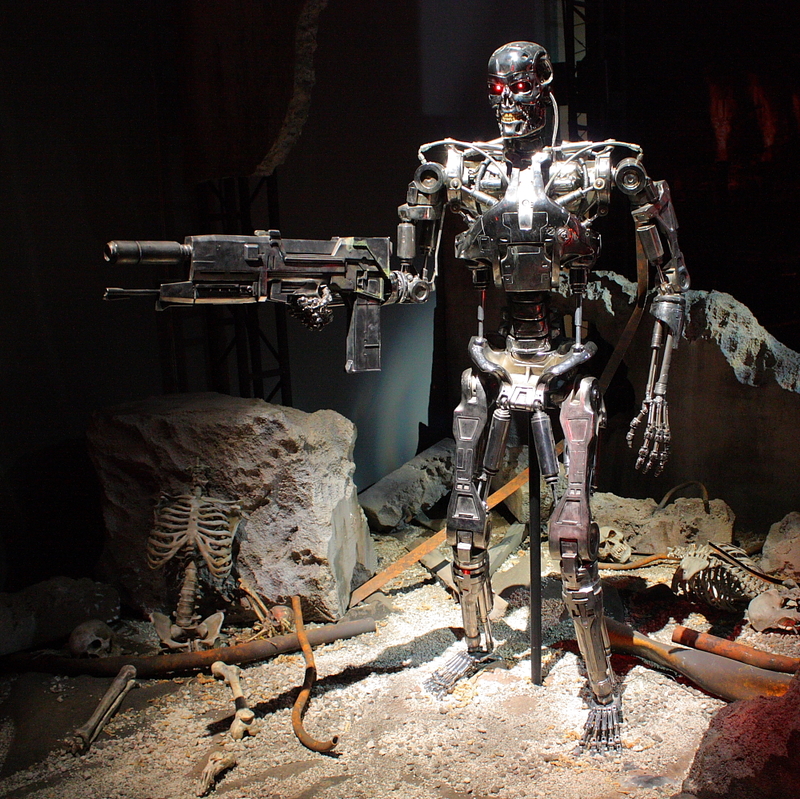 The T-1000 is not displayed in this exhibit. 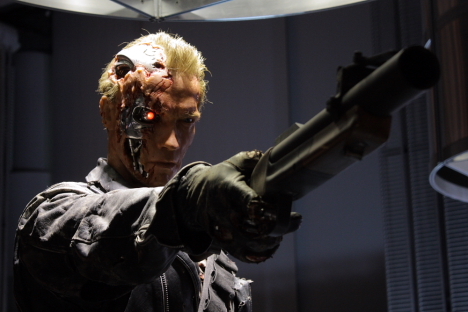 In Terminator 3, the T-800 (T-850) is again sent from the future to protect John Connor. This time it does battle with the T-X, a super-powerful Terminator that combines the exoskeleton of the T-800 with the shape-shifting liquid metal of the T-1000. 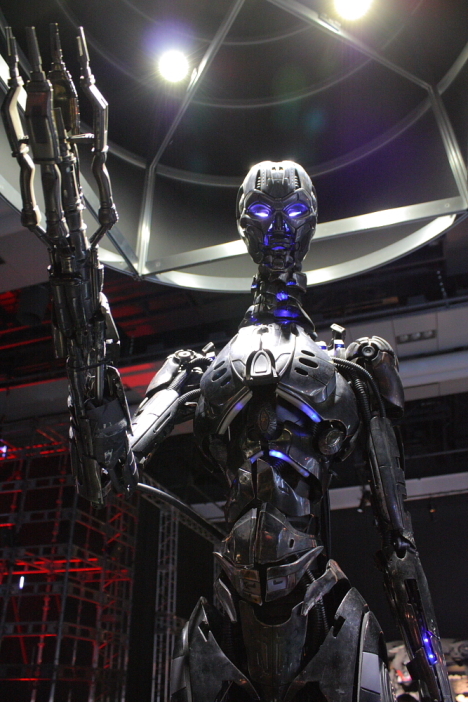 The T-X, also called "Terminatrix," takes the shape of a beautiful woman and incorporates a variety of weapons into its endoskeleton. In addition to conducting DNA analysis by tasting blood, the shape-shifting assassin can remotely control other machines and Terminators. Other items on display include a reproduction of Cameron Philips (TOK715), a reprogrammed Terminator from the "Sarah Conner Chronicles" TV series. The exhibit also includes a few props and movie trailers from the forthcoming film. Set in the year 2018, Terminator Salvation will prominently feature the T-600, an early Terminator prototype. 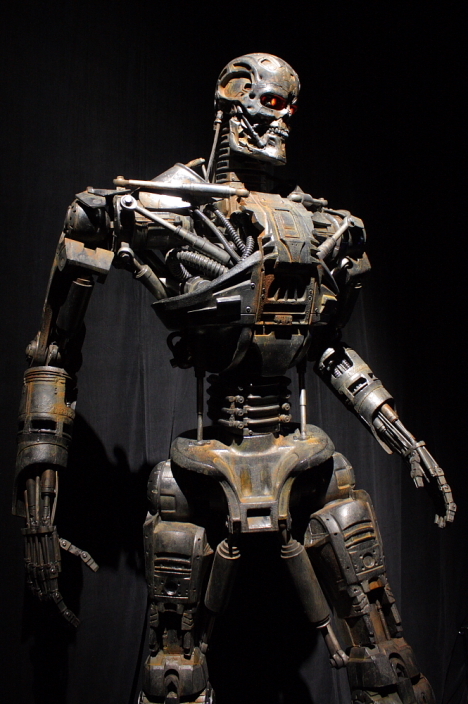 Unlike the T-800 portrayed by Schwarzenegger in the previous films, the more primitive T-600 features an endoskeleton covered in synthetic skin instead of living human tissue. At 8 feet tall, it is also much bulkier. 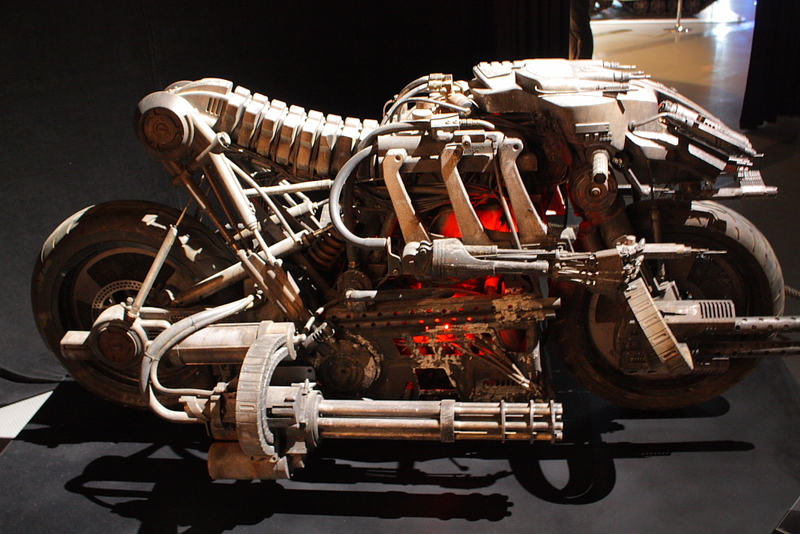 Also on display is the Moto-Terminator, a motorcycle-based death machine, as well as the Hydrobot (not pictured here), a menacing eel-like underwater robot. The final section of the exhibit introduces a variety of Japanese robot technology, mostly in the form of text-heavy exhibits (Japanese only). However, an Actroid -- smartly dressed in a skin-tight black jumpsuit -- is on hand to liven things up. The exhibit runs until June 28, 2009. Very cool to see all terminators in a line up! Zak: those pics are the bomb. they are so cool.